Recombinant fragment, amino acids 31-547 (Human). This antibody recognizes a surface epitope of Hsp60 in the region of amino acids 288-366. HeLa Heat Shocked Cell Lysate or Recombinant Human Hsp60 Protein IF/ICC: HeLa cell line. Our Abpromise guarantee covers the use of ab13532 in the following tested applications. WB 1/10000. Detects a band of approximately 60 kDa (predicted molecular weight: 68.8 kDa). ICC/IF image of ab13532 stained HeLa cells. The cells were 100% methanol fixed (5 min) and then incubated in 1%BSA / 10% normal goat serum / 0.3M glycine in 0.1% PBS-Tween for 1h to permeabilise the cells and block non-specific protein-protein interactions. The cells were then incubated with the antibody (ab13532, 5µg/ml) overnight at +4°C. The secondary antibody (green) was ab96879, DyLight® 488 goat anti-mouse IgG(H+L) used at a 1/250 dilution for 1h. Alexa Fluor® 594 WGA was used to label plasma membranes (red) at a 1/200 dilution for 1h. DAPI was used to stain the cell nuclei (blue) at a concentration of 1.43µM. Overlay histogram showing HeLa cells stained with ab13532 (red line). The cells were fixed with 80% methanol (5 min) and then permeabilized with 0.1% PBS-Tween for 20 min. The cells were then incubated in 1x PBS / 10% normal goat serum / 0.3M glycine to block non-specific protein-protein interactions followed by the antibody (ab13532, 0.5µg/1x106 cells) for 30 min at 22ºC. The secondary antibody used was DyLight® 488 goat anti-mouse IgG (H+L) (ab96879) at 1/500 dilution for 30 min at 22ºC. Isotype control antibody (black line) was mouse IgG2a [ICIGG2A] (ab91361, 1µg/1x106 cells) used under the same conditions. Acquisition of >5,000 events was performed. Publishing research using ab13532? Please let us know so that we can cite the reference in this datasheet. Thank you for the reply. Please add the replacement to our this week order that will be shipped on Friday. It is very urgent for the customer since they have to publish a paper. Thank you for the understanding and cooperation. Thank you for your reply. I have requested that a vial of ab13532 be added free of charge to your next order. I apologize for any inconveniences caused to the customer. Please do not hesitate to contact me if you have any additional questions. Thank you for contacting Abcam regarding ab13532. I am sorry that the lot the customer has just received of this antibody is not working as well as previous lots. I would be happy to offer a replacement for the customer. Can you please provide the order number? I look forward to your reply so that I may assist you further. Please do not hesitate to contact me if you have any additional questions. BATCH NUMBER -- NOT SPECIFIED -- ORDER NUMBER -- NOT SPECIFIED -- DESCRIPTION OF THE PROBLEM No staining SAMPLE fibroblast PRIMARY ANTIBODY 1 hour incubation of HSP60 antibody with fibroblast cells DETECTION METHOD Cy5-anti mouse antibody POSITIVE AND NEGATIVE CONTROLS USED Negative control: PBS control no antibody added on the cells Positive control: primary antibody anti-mitochondrial proteins ANTIBODY STORAGE CONDITIONS storage at -20 degree aliquots of 5 ul FIXATION OF SAMPLE formaldehyde PERMEABILIZATION STEP Triton X100 0.2% BLOCKING CONDITIONS BSA 1%PBS SECONDARY ANTIBODY biotinylated antibody 1/300 in PBS, 2 washs in PBS later HAVE YOU RUN A "NO PRIMARY" CONTROL? Yes DO YOU OBTAIN THE SAME RESULTS EVERY TIME? Yes ADDITIONAL NOTES I need the initial concentration of your antibody since it is not mentionned on the samples neither on the website. 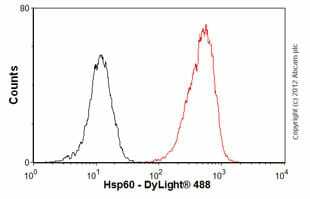 Please could you forward me more informations regarding detection of HSP60 protein by fluorescence. Thank you for your enquiry and for completing our technical questionnaire. I am sorry to hear that you have been having difficulties with this antibody. I have read your questionnaire and I have a few comments. When you state that you used a positive control antibodies to detect mitochondrial proteins can you please tell me whether you were successful or not. For the technique of immunocytochemistry the permeabilization is crucial. I would therefore like to recommend that you perform a 30-min incubation in PBS containing 0.5% Triton X-100 as detailed in the methods section of Satoh et al., (1998). In the paper they have applied a hsp60 antibody using fibroblasts and whilst they have not used an Abcam antibody they have presented the antigen successfully to the antibody using these permeabilization conditions. Satoh J, Yukitake M, Kurohara K, Nishida N, Katamine S, Miyamoto T, Kuroda Y. (1998) Cultured skin fibroblasts isolated from mice devoid of the prion protein gene Express major heat shock proteins in response to heat stress. Exp Neurol. 151(1):105-15. PMID: 9582258 I would like to recommend that you supplement this permeabilization step into our ICC protocol which differs slightly from the protocol that you have detailed by fixation using paraformaldehyde rather than formaldehyde and washes using PBST. It can be accessed at the following link: https://www.abcam.com/assets/pdf/protocols/Immunocytochemistry%20(ICC)%20protocol.pdf I would also like to recommend that you perform a series of dilutions to determine whether you can obtain any staining. Unfortunately we do not have details of the optimal dilution and this should be determined empirically and future experiments adjusted accordingly. I will contact the source of this antibody to determine whether it has been quantitated. However, given that it is a monoclonal antibody it is predicted to be between 0.5 and 1mgml-1. I hope this information helps, please do not hesitate to contact us if you need any more advice or information. This antibody goes only by volume even though it is purified protein. The amount is proprietary information.